I just replaced the lo beam bulbs with the new Toshiba HIR bulbs from Daniel Stern - around $55 shipped. Anyone else have these? Your observations? My initial thoughts are that they are not as bright as the lumens suggest. Then again, we don't really drive at night very much and I just looked at the lights in the garage right after install. I may also do the headlight wiring upgrade where a relay is added. I received my 9012/HIR2 low-beam bulbs from Daniel Stern a few weeks ago but haven't installed them yet. 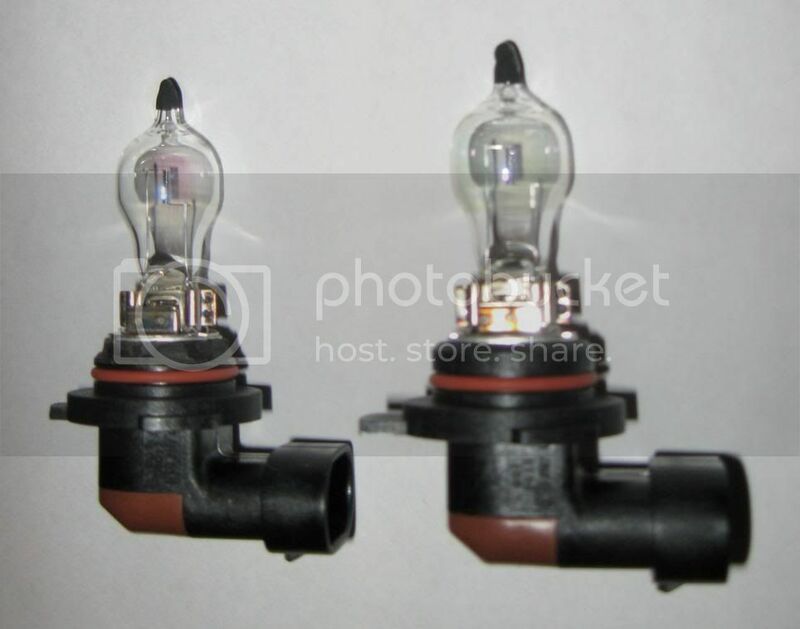 I contacted Daniel to inquire about upgraded H4 bulbs for my Mazda and also asked about the Odyssey, it seems a few years ago he was not recommending the HIR bulb in our application (refer to the 9011 Bulb thread) but now says the headlight beam pattern changed early in 2005 and the HIR bulb is a nice upgrade. It seems to be the next best thing to a HID upgrade. I currently have Silverstars which are just over 1 year old so I expect them to burn out any day now, the HIR 9012 is rated at 800 hours from a few sources compared to 1000 hours on stock bulbs and 150 hours on the Silverstar. I paid $105.80 for all four lights shipped. That’s 26.45 for each light. 4. Side by side photographs cut and pasted together showing both the High & Low pictures side by side of the HIR and factory halogens. Dont hold your breath, but I may even purchase an xtravision bulb to throw into the mix just for comparison. I am disregarding testimony from other members pertaining to how difficult it is to replace the high beam lights....I may regret this later, however for better or for worse they're getting installed. Primarily because the idea of turning my high beams into "photon torpedoes" is too irresistible. Before I sold our 2002 EX-L RES NAV I had installed Sylvania Silver Stars. While the SS were defiantly whiter that the xtravisions they replaced; I wouldn’t say they were brighter or illuminated any further down the road. My impression is that whiter seems brighter. After reading the fine motor article I regret purchasing the Silver Stars. I look for forward to reading about your impressions. As I've posted elsewhere, the difference between Sylvania Silverstars, Osram Silverstars and the Sylvania XtraVisions were negligible at best (on my Miata H4 headlights). The price just isn't worth it. When the HIRs burn out eventually, I may just order HIDs for the Ody. Hello! Do you have any comment/photos about your HIR? Thanks! Have you had any trouble installing these bulbs? I tried to install 9012 on 2009 Ody. But it does not fit. I did the tab trimming as instructed so the tab is not the problem. The base of 9012 is larger than stock bulb. It just does not fit. How did you install it? OK, I found answer with some google search. I had to modify the base. Base of HIR is thicker than 9006. Last edited by thelinux; 03-28-2009 at 05:39 PM. I had to loosen the 3 screws on each retaining ring. It is a real pain to get to some of the bulbs due to the obstacles under the hood. I put HIR in both High and Low beam lights. I am happy with them and have also put them in my 06 Acura RL and 08 Ford Taurus. I just remembered that I also put a little dielectric compound on the o-rings. I will also be installing them in my wife's car too. I do wish they made a HIR in H4 and H3, PAR36 or 801 so I could use this technology on my motorcycle too. I had to trim away the base of the bulb. Without doing it, the bulb did not sit tight. Even if after the base trimming, I still had to loosen two screws to get this thing to be installed. Do you guys have 2005-2007 model? Mine is 2009 and 2008-2009 has different headlight housing than 2005-2007. Anyway, I did some driving in the night. The result was somewhat disappointing. Honestly, I don't see much improvement in terms of brightness. It is supposed to be about twice brighter but some how I don't see much difference. I know some people put 9011 for low beam got a lot better result. But that I don't want to do because it's illegal. OK, so was this worth $60 for me??? No. I should have saved it for HID retrofit project. BTW, the ebay seller raised the price of 9012 to almost $40. Toshiba stopped making this anymore. That's why. rallylights.com still sells them for under $30. can someone who has put the 9011 (hi beams) into their low beam socket post their results? I'd like to put 9011 in my low, but I don't want to blind oncoming traffic. Anyone have any experience? Are any adjustments to the aim the lights lower?